This large tote is ideal for carrying your personal items on a weekend getaway, out shopping, or even to an outdoor concert! 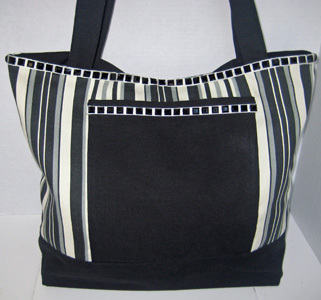 Bag is made of striped cotton canvas print w/contrasting solid black canvas on lower portion of bag. Large outer front pocket, and lined with black cotton canvas. Magnetic snap closure. Inside pockets extend across the interior of the bag. Cream-colored ribbon trim with black square beaded embellishments line outer edge and outer front pocket. Size approximately 20"W x 14-1/2" L.